3/4 x 1/2-inch Sterling Silver St. Christopher / Paratrooper Pend. This Catholic medal will arrive with an 18-inch silver chain, in a beautiful jewelry box ready to be the perfect religious gift. Note: If the item is engraved, the image on the reverse side is removed. This 14K White Gold Praying Angel Lapel Pin measures 12 x 10 mm, roughly equivalent to 1/2 by 1/4-inch. The weight of this particular piece of religious jewelry is 0.56 grams. It comes ready for gift-giving in an attractive jewelry box. This pendant is made of solid 14 karat white gold. OL GUADALUPE 8" x 10" Gold Framed Everlasting Plaque, Clear Lamination. This Our Lady Guadalupe 8X10 Plaque features the CatholicShop.com money-back guarantee. Get 100 pieces for one low bulk price with our 100-Pack of Guardian Angel Girl With Prayer Holy Card. Only available in this bulk pack. 2"x4" Paper Holy Card with gold edges. Available in solid subjects.Pack of 100 holy cards. Our St. Francis Xavier 25-Pack features 25 units for one low price. Saint Francis Xavier Silver Oxidized Medal. This 16-inch Sterling Silver Black Satin Cord With Lobster Clasp features our money-back guarantee and usually ships the same day if ordered before 6PM Eastern Time. Featuring a width of 2mm, this Black Satin Cord weighs 0.53 grams. Paired with one or more religious pendants, this 16-inch-long chain makes an attractive necklace. 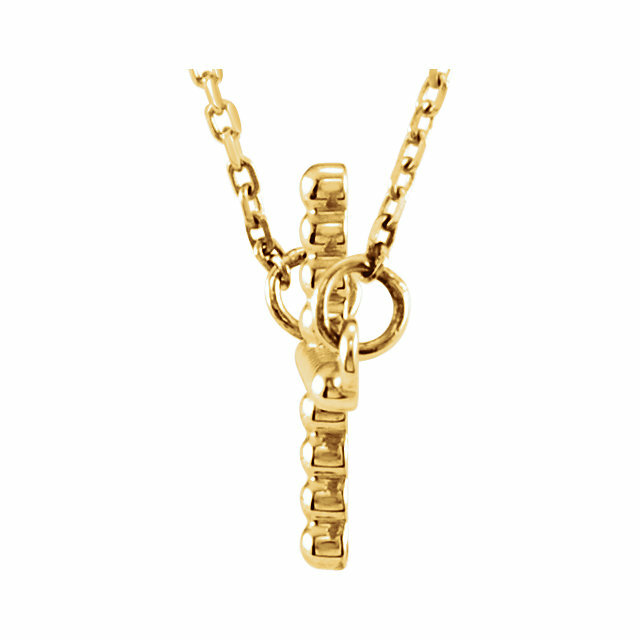 This 20-inch 14K Yellow Gold Diamond Cut Rope Chain With Lobster Clasp features our money-back guarantee and usually ships the same day if ordered before 6PM Eastern Time. Featuring a width of 1.6mm, this Diamond-Cut Rope Chain weighs 4.08 grams. 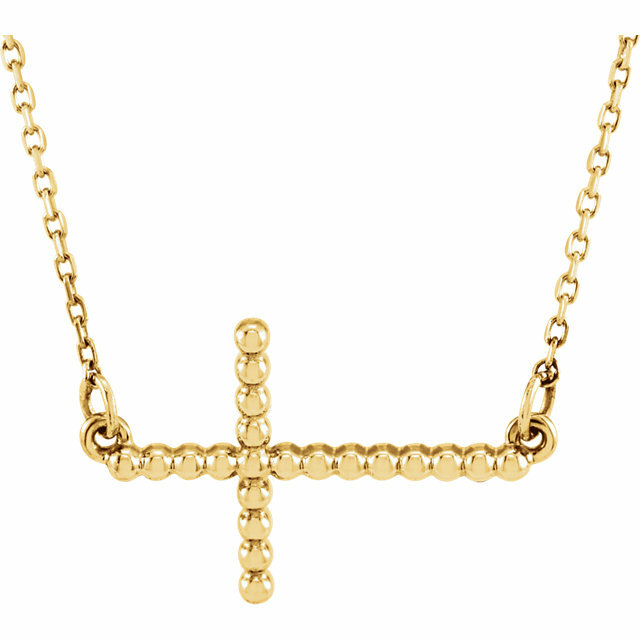 Paired with one or more religious pendants, this 20-inch-long chain makes an attractive necklace. Our Platinum Youth Butterfly Disc 15" Necklace features our 60-day money back guarantee and free Shipping Insurance, as does our entire line of religious jewelry. Part of our Religious Necklaces line, this Youth Butterfly Disc Necklace features a weight of 1.774 DWT, which is the equivalent of 2.76 grams. Made in the USA. Comes in a high-quality, attractive jewelry box. Our Platinum Youth Heart with Cross 16-18" Necklace features our 60-day money back guarantee and free Shipping Insurance, as does our entire line of religious jewelry. Part of our Religious Necklaces line, this Youth Heart with Cross Necklace or Pendant features a weight of 2.3458 DWT, which is the equivalent of 3.65 grams. This 14K Sideways Beaded Cross with 16.5" Necklace has passed our quality control assessment and meets our strict criteria to be a Catholic Shop product. Buy with confidence.